(OR) The term paranormal is used to describe a wide variety of activity and phenomena. According to the Journal of Parapsychology (a quarterly publication devoted primarily to the original publication of experimental results and other research findings as published by the Parapsychological Association), the term paranormal describes "any phenomenon that in one or more respects exceeds the limits of what is deemed physically possible according to current scientific assumptions." The actual word is derived from the Latin use of the prefix para meaning "outside or beyond" what is considered normal. Many people associate the term paranormal as only dealing with hauntings and ghosts. However, the paranormal also includes subjects considered to be outside the scope of parapsychology including UFOs, cryptozoology, telepathy, ESP, faith healing, clairvoyance, and many other subjects. An anomalous phenomena is an observed incident or experience for which there seems to be no agreeable scientific explanation. Because such observations do not easily fit into how many view our reality, these instances can be (and usually are) the subject of controversy. The scientific PI approaches an investigation with an open mind, collects and examines as much relevant evidence as is reasonable for the claim being investigated, develops hypotheses, and tries to falsify them. Yes, a scientist tries to falsify, not verify, his hypothesis. If you set out to verify your hypothesis you are very likely to be misdirected by confirmation bias. You will look only for those things that confirm what you believe and you will systematically ignore those things that might disconfirm your belief. To keep an open mind, the scientist, like a good detective, must not form hypotheses too early in the investigation, as the tendency of all of us is to confirm, not disconfirm, our hypotheses. Unless you are lucky, and your first guess happens to be the right one, you run the risk of building up a convincing case for a false claim. (The study of criminal profiling offers examples of the dangers of forming hypotheses too early in an investigation.) The importance of trying to collect data that is relevant to the investigation in such a way that one's biases don't lead one to ignore important avenues of investigation cannot be overemphasized. A scientific PI does all the necessary groundwork before actually setting out to a location, including historical research and interviewing people. One example should suffice to illustrate this point. Paranormal investigators must be skilled at evaluating sensory data and be well trained in evaluating data based on observation or testimony. They should also know the nature and limits of their technological equipment. Using a psychic, a person who claims to have a special sense for detecting the presence of the Jinn world, is evidence that the investigator is not being scientific or skeptical. The psychic says: "I feel so very emotionally and physically drained. It was like something grabbed me by the shoulders." He may be telling the truth but how do we know his feelings have anything to do with devils? If the psychic strongly believes in ghosts, for all we know it is her belief that is driving her experience and causing her to hallucinate. Unfortunately, we have no independent way of testing the connection between a psychic's feelings and the presence of devils. Imagine a gold prospector who is told by a "gold sensitive" that she can feel the gold in the hill the miner is considering spending his money and time excavating. With no way to independently test the connection between the sensitive's feelings and the presence of gold, why would he use such a tool? At best the sensitive or psychic is irrelevant in our quest for either gold or devils. Some ghost or devil trackers use a Geiger counter in their investigations. This tool is particularly ridiculous in the hands of ghost hunters who think ghosts are immaterial beings. Some ghost hunters also use dowsing rods. These are wooden or metal sticks that dowsers use to find water, gold, oil, golf balls, etc. These devices have been studied and the evidence is that they are of no use in locating physical objects, except perhaps to lift the corner of a rug or curtain to see if a coin may have slipped under the edge. So, why would anyone think they would be useful in detecting ghosts? Many, if not most, devil hunters use video cameras and sound recorders in their investigations. Any data captured by these devices must be interpreted. This is especially problematic with sound, as anyone familiar with EVP (so-called electronic voice phenomena) knows. You hear something vague and nebulous and identify it as a voice of a devil. Or you hear something clear and crisp and you identify it as a devil. But how do you know the sounds were made by a ghost? Not only do the sounds have to be identified as being intelligible and coming from an intelligent creature, the origin of the sound is unknown. Rather than investigate various possible origins, the PI jumps to the conclusion that the sounds are those of a devil. For those who think devil are Jinns or energy beings, I ask: How do you videotape a non-physical being or "energy entity"? A video camera, even an infrared camera, seems like a very inappropriate tool for a PI, unless you are trying to detect a hoax or a mundane cause of some weird phenomenon. Infrared ("below red") wavelengths are longer than red light, the color of visible light with the longest wavelength, but there is no reason to suspect that anything picked up by an infrared camera isn't caused by a non-ghostly physical object. * Infrared detectors are used in night vision cameras. As those of us who have such cameras know, they allow you to see things in the dark that you can't see with the naked eye (unless you turn on a light!). They don't allow you to peek into another dimension of reality. Some PIs use a motion detector in their investigations. They hook it up to a monitor and watch a site from a remote location. Anything affecting such a device would have to be physical, however, so why would this tool be useful to the ghost hunter who thinks he's looking for a Jinn? If, on the other hand, you assume the ghost manifests itself physically, you still have the problem of determining when an instrument reading is cause by a ghost and when it is caused by something else. You can't just say that since you don't know the origin of the cause of the reading, it's probably caused by a ghost! AUTOMATIC WRITING: The ability to write intelligible messages without conscious control of what is being written. Often used in conjunction with trying to channel a Jinn or entity into yourself. This can be a very dangerous method! As with all channeling methods (Ouija boards, crystals, etc.) you are opening a door way and have no control over who or what may come through, and no way to be sure to make it leave and "close the door". COLD SPOT: A small, defined area of intense cold (at least 10 degrees colder than the surrounding area) that cannot readily be explained by other natural or mechanical causes (e.g. air conditioning, a drafty window, ice or snow). In paranormal research the prevailing theory is that when amenity is trying to manifest itself it draws on many sources of energy. One of those sources is the heat energy in the air. As the entity draws the heat out of the air the area in that specific immediate location becomes unusually cold. See our article on Paranormal Temperature Theory. CLAIRAUDIENCE: The ability to hear things not audible within normal hearing ranges. This is an example of Extra sensory perception. (ESP) It includes the audible perception of devils, and those who are on the astral realm. Clairaudience is essentially the ability of hearing the paranormal as opposed to seeing it. DEBUNK/ EXPOSE (DEBUNKING EVIDENCE or PARANORMAL ACTIVITY): Reported paranormal evidence or paranormal activity is said to be "debunked" when a simple, logical and non-paranormal explanation can account for the reported event(s). Even if the activity is genuinely paranormal, if a simple and reasonable explanation can also be applied, because of this ambiguity a prudent paranormal investigator has to side with the debunking explanation until further evidence of paranormal activity can be obtained. Care has to be used since it is easy to be skeptical of any report or evidence. Usually if the non-paranormal explanation is complex or requires many assumptions it may be over analyzing the situation. RAAQI: One who treats people who get effected by Jinn Possession or Mental disturbances etc. DOWSING: The ability to use a pair of rods (often metal) held in the hands to locate objects, most commonly water. A Y-shaped tree branch can also be used for finding water. In the paranormal investigation field Dowsing Rods are sometimes used to locate energy sources that could be paranormal in nature. ECHOLALIA: A professional clinical word that means to repeat back what you hear. As applied to the paranormal field it means when a ghost or Jinn repeats back something you have just said in order to show they are there and are trying to communicate with you. The words repeated back could be EVP questions or just casual conversation. It is not clear why an entity might repeat back your words rather than respond on their own. EMF - Electro Magnetic Field: In it's natural form it is the natural electric field (sometimes thought of an aurora) that is generated by all living things and many inanimate objects such as metals and certain minerals. EMF is also generated by man-made electric sources such as lights, radios and wires. In paranormal investigations the theory is that entities are largely composed of energy which may be electrically based. By trying to detect EMF it may be possible to locate an otherwise unseen entity. The stronger the EMF detected the potential greater the paranormal phenomena. EMPATHS - EMPATHIC ABILITIES: Some people are sensitive to the typically stronger feelings a paranormal entity gives off. They may also be able to see people and events that have occurred years in the past at a given locations. While feelings are hard to confirm or deny, when recorded along with other paranormal evidence that can be documented, empathic ability can be a helpful investigation tool. 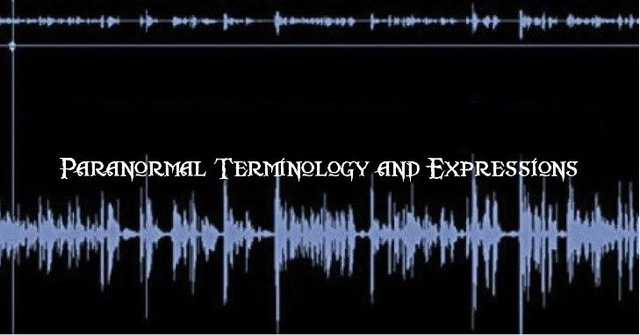 EVP - Electronic Voice Phenomena: The hearing of unexplainable voices during the playback of a recording made on a electronic recording device. The voices cannot be readily identified as persons speaking or events (mechanical sounds, background noise etc) that took place while the record was being performed. Can be encountered on both tape and digital recorders. Sometimes also found on video recorders (not film however). FEAR CAGE: A term used to describe a confined area such as a walk in closet, hallway or basement with very high EMF readings. The combination of being close and confined within an area of strong EMF often brings out extremely great feelings of uneasiness, anxiety, paranoia and/or uncontrollable fear. When this occurs the best thing is to quickly and calmly leave the area and go to a more open area with lower EMF. HALF REAL OBJECTIVE: When you perceive nothing subjectively but obtain objective documentation. HALF REAL SUBJECTIVE: When you subjectively perceive something that was not documented via objective means. IR (INFRARED): Infrared light is light from the lower end (long wave length/low frequency) of the electromagnetic spectrum (between the visible light spectrum and microwaves). IR light is not visible to the naked human eye without the use of special equipment. IR is not to be confused with thermal imaging. While IR and thermal energy are both on the short end of the electromagnetic spectrum they are not the same thing. There is evidence that Jinns and other paranormal entities may be more susceptible to being viewed (including video and image photography) using the IR light spectrum. IR sensors are also often used for measuring temperature and detecting movement. KINETIC ENERGY: Energy needed to force an object at rest into motion. Objects in motion have kinetic energy. Energy is neither created nor destroyed. As the kinetic energy diminishes it changes into potential energy. MANIFEST or MANIFESTATION: The act of an entity trying to make itself appear in our world. Entities are believed to exist with no physical form. When an entity is trying to make itself appear or make its presence known in our world it is said to be manifesting itself; trying to make itself into some form of physical state which can be human or animal forms. MIST: An energy field that looks like a cloud or haze but has a paranormal ectoplasm substance. There may or may not be any particular shape, color (typically white or light colored), thickness, or consistency. PARANORMAL: Events above the normal or everyday experiences. Events that cannot be readily explained by known conventional reasons and/or commonly accepted science. SHADOWS: (Shadow Beings, Shadow Entities) Shadows refer to the possible paranormal apparition which appears as a dark manifestation. We say "possible" paranormal apparition since the true nature of this type of paranormal event is still unknown and the subject of much research. SUPERNATURAL: Events or happenings generally attributed to the will of a deity. TOUCHED: The act of experiencing physical contact from devil or Jinn. Can be as simple as a tug in your shirt or pressure on a part of your body to scratches, burns or being pushed/shoved. However, serious physical injury is very rare. ULTRAVIOLET (UV): Ultraviolet light is light from the upper end (long wave length/low frequency) of the electromagnetic spectrum. As with Infrared, UV light is normally not visible to the naked human eye without the use of special viewing or photography equipment. Some paranormal investigators have experimented with using UV light to take video of ghosts and other paranormal entities. The results have been indeterminate. Other paranormal investigators have claimed UV light is an effective barrier to block demonic entities. WHITE NOISE: White noise is the random non-descript static sound produced by various electronic devices. The sound covers and combines all wavelengths and frequencies. In this way it is like the color white which is really a combination of all colors. Hence the name white noise – the combination of all sounds. Examples of common white noise sources are the radio or television static when set to an empty channel, the hum of an electric fan motor and the babbling sound of a fast moving stream or brook. Type I: When the subjective and the objective appear at the same time. Type II: When the subjective and the objective appear at different times. Note: If you find any statement which contradicts Islamic Shariah then please contact us for corrections.